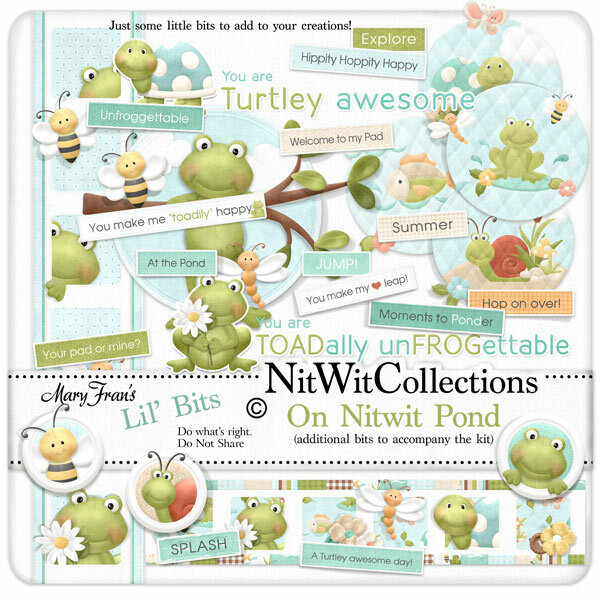 Lil' Bits "On Nitwit Pond" digital elements pack is the perfect purchase of ready to use, premade elements. Check out the frog, snail and bee peeking out from their circle brads, and the quilted circles with scenes already in them. They are so easy to use to add life and character to your scrapbooking layouts and cards! Don't miss out on these digital elements as they are not included in the FQB "On Nitwit Pond" Collection so don't pass these by! 1 Horizontal Border with critter faces peeking out at you. 1 Sticker of our frog, bee, and dragonfly doing what they do best....just hanging around! 1 Wordart - "You are Turtley Awesome"
1 Wordart - "You are TOADally....."